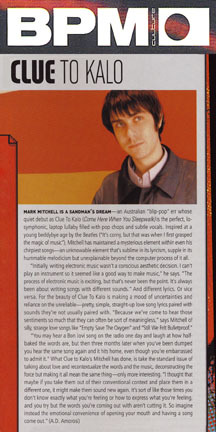 Mark Mitchell is a sandman's dream - an Australian "blip-pop" err whose quiet debut as Clue to Kalo (Come Here When You Sleepwalk) is the perfect, lo-symphonic, laptop lullaby filled with pop chops and subtle vocals. Inspired at a young beddybye age by the Beatles (It's corny, but that was when I first grasped the magic of music"), Mitchell has maintained a mysterious element within even his chirpiest songs - an unknowable element that's sublime in its lyricism, supple in its hummable melodism but unexplainable beyond the computer process of it all. "Initially, writing electronic music wasn't a conscious aesthetic decision. I can't play an instrument so it seemed like a good way to make music," he says. "The process of electronic music is exciting, but that's never been the point. It's always been about writing songs with different sounds." And different lyrics. Or vice versa. For the beauty of Clue to Kalo is making a mood of uncertainties and reliance on the unreliable - pretty, simple, straight-up love song lyrics paired with sounds they're not usually paired with. "Because we've come to hear those sentiments so much they can often be sort of meaningless," says Mitchell of silly, strange love songs like "Empty Save The Oxygen" and "Still We Felt Bulletproof." "You may hear a Bon Jovi song on the radio one day and laugh at how half-baked the words are, but then three months later when you've been dumped you hear the same song again and it hits home, even though you're embarrassed to admit it." What Clue to Kalo's Mitchell has done, is take the standard issue of talking about love and recontextualize the words and the music, deconstructing the force but making it all mean the same thing - only more interesting. "I thought that maybe if you take them out of their conventional context and place them in a different one, it might make them sound new again. It's sort of like those times you don't know exactly what you're feeling or how to express what you're feeling, and you try but the words you're coming out with aren't cutting it. So imagine instead the emotional convenience of opening your mouth and having a song come out."